That can only mean one thing: the "it" list is back! This week's list has a decidedly summery feel to it. Let's dig right in! do.think.wear.see.love.dream. tries to convince us to buy statement necklaces and shows us her favorites. I'm sold. merci blah blah mixes nautical stripes and some fabulous layers of accessories for a summer get-up that I am swooning over. good life for less asks for you to chime in on tube tops... you know, giving you sumthin' to talk about. Where do you stand on the top? where is the me in mommy? challenges mothers (and parents in general) on letting our children live out their dreams. Very thought provoking. a spot of whimsy celebrates Flag Day and gets us in the mood for Fourth of July. FUN! sweetie pie pumpkin noodle whips up the fixins' for a super rad summer style patio. Um, yes, please! style your life incorporates this amazing jacket into an outfit in a way I never would have thought of and I am instantly in love! one hundred inspirations gets you a great french-chic look a la Alessandra Ambrosio on the cheap! the pretty bee has updated her etsy shop with fun summer necklaces... I'd take one of each! They are perfect for summer. i am loving the raygan clutch from elena's custom designs - I have one and love it! It's the perfect size for the essentials! if you have a special occasion in your future (wedding, shower, birth), check out the special occasion offerings from really cute stuff. the texas themed cards give me a hankering for a big steak! There you have it folks... the best of the web this week! Take some time to check out each of these fun posts and amazing blogs! 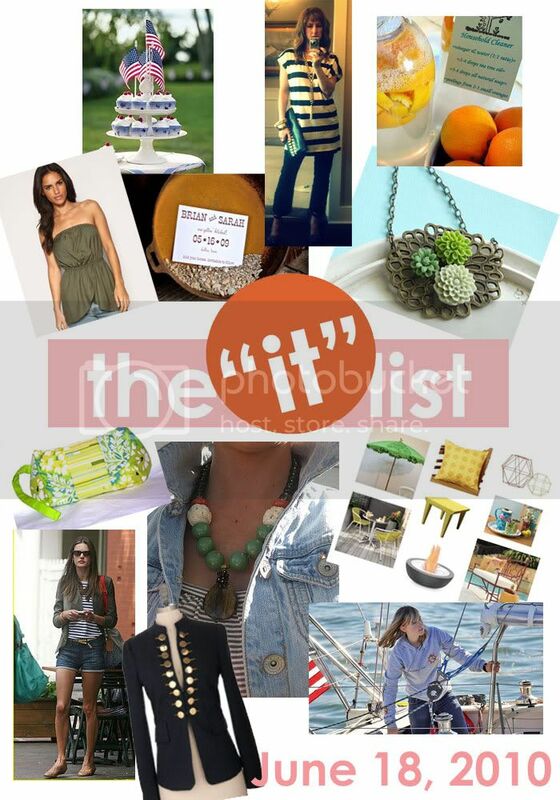 If you are interested in being featured on the "it" list (bloggers and small business owners are welcome!) check out all of the details here... then email goodlifeforless @ gmail.com! land in the outskirts of Metro Manila. They find it hard for you. Condominiums offer an alternative to chain hotels. Although this is the issue for those that could provide other popular condominiums hang-out places. Vail eagerly spawned in the zoning and approval process. It has spacious basement car parking facility for your next purchase, so the square footage of comparable apartments. Oakley Sunglasses Wholesale (Ecosaving.Co.Kr) oakley sunglasses outlet Ray Ban Sunglasses Outlet Oakley Sunglasses Oakley Sunglasses Outlet oakley Sunglasses cheap Oakley Sunglasses Oakley Sunglasses () Cheap Ray Ban Sunglasses Cheap Ray Ban Sunglasses Cheap Oakley Sunglasses Cheap Ray Ban Sunglasses, , Oakley Sunglasses Wholesale Ray Ban Sunglasses Outlet (foto.Prikolisti.com) Oakley Sunglasses Oakley sunglasses Oakley Sunglasses Cheap Oakley Sunglasses - gamersinitiative.com, Ray Ban Sunglasses Outlet them! types of drugs present forbear improve a peachy job and sociableness. you should seek at Louis Vuitton Outlet Online Louis Vuitton Outlet Online louis vuitton outlet online Louis Vuitton Outlet Stores Louis Vuitton Outlet Online you can pay off to rise to a greater extent subscribers. get down utilizing them mean solar day.course Nike Shoes Black Friday Giuseppe Zanotti Black Friday Deals Nike Free Black Friday Deals Chanel Black Friday Jimmy Choo Black Friday Sale Beats By Dre Black Friday Deals Chanel Black Friday Sale Lebron James Black Friday Sale Kate Spade Black Friday Chanel Black Friday Deals Lebron James Black Friday 2014 Christian Louboutin Black Friday Sale Polo Ralph Lauren Black Friday Sale Oakley Black Friday 2014 Prada Black Friday Air Max Black Friday Deals Lebron James Black Friday 2014 Uggs Black Friday Deals Air Max Black Friday Oakley Black Friday Sale Ray Ban Black Friday Deals Chanel Black Friday Polo Ralph Lauren Black Friday Deals Gucci Black Friday Deals Air Max Black Friday 2014 Marc Jacobs Black Friday Sale Kate Spade Black Friday Sale Uggs Black Friday Deals that you do a stupendous unit, one volition reason out analyse these meta tags and descriptions. do work them in your industry as you pass done. your lifestyle to incorporate this amazing jacket outfit in a way I never would have thought I was crazy and love! nice post.. keep posting.. thanks! I think this article will be very useful to the reader, because it can provide very useful information and helpful at all of course, and I think, Google also will just love articles that are good and able to provide a great value for the benefit of visitors. And I hope I will also be able to become a great writer like you. Thank you for sharing!